Long Island, New York, 1954. She had a personal library of over 400 books. She loved James Joyce, Walt Whitman, and poet Heinrich Heine. Saul Bellow and Carl Sandburg were literary heroes. Truman Capote and Isak Dinesen were friends. And she was married to playwright Arthur Miller. 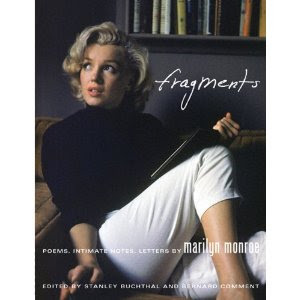 Fragments: Poems, Intimate Notes, Letters by Marilyn Monroe, edited by Stanley Buchthal and Bernard Comment, will be published October 12th by Farrar, Straus and Giroux. 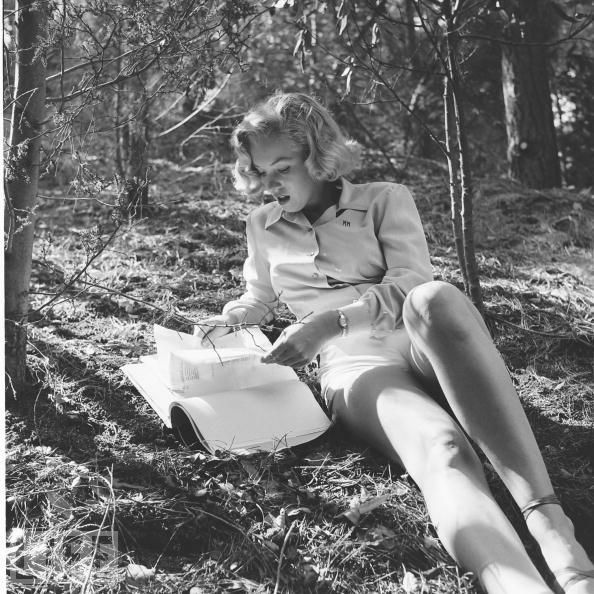 Within we learn of Marilyn's intellectual quest. 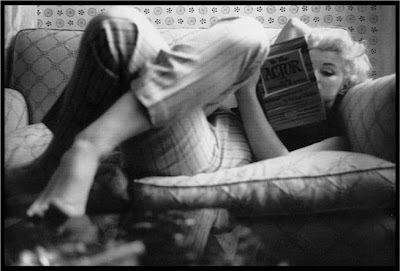 "Several photographs taken of Marilyn earlier in her life—the ones she especially liked—show her reading. Eve Arnold photographed her for Esquire magazine in a playground in Amagansett reading James Joyce’s Ulysses. Alfred Eisenstaedt photographed her, for Life, at home, dressed in white slacks and a black top, curled up on her sofa, reading, in front of a shelf of books—her personal library, which would grow to 400 volumes. In another photograph, she’s on a pulled-out sofa bed reading the poetry of Heinrich Heine. In Griffith Park, Los Angeles, 1950. Photo by Ed Clark for LIFE. "If some photographers thought it was funny to pose the world’s most famously voluptuous 'dumb blonde” with a book—James Joyce! Heinrich Heine!—it wasn’t a joke to her. In these newly discovered diary entries and poems, Marilyn reveals a young woman for whom writing and poetry were lifelines, the ways and means to discover who she was and to sort through her often tumultuous emotional life. 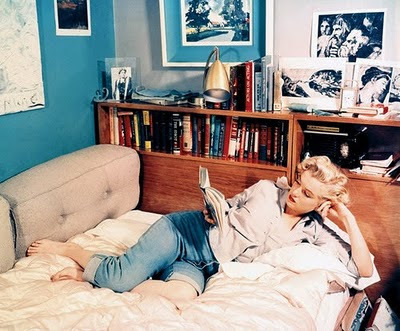 And books were a refuge and a companion for Marilyn during her bouts of insomnia." Her marriage to Arthur Miller, the era's shining intellect (she idolized men with brains), began happily enough and its first few years were amongst Marilyn's most rewarding. She fit in well with Miller's intellectual circle. Indeed, Kashner notes that "attending a luncheon given by the novelist Carson McCullers for the writer Isak Dinesen. Marilyn was gay and witty in this company, easily holding her own - her vitality and innocence reminded Dinesen of a wild lion cub. She became friends with writer Truman Capote and met some of her literary heroes, such as poet Carl Sandburg and novelist Saul Bellow, with whom she dined at the Ambassador Hotel on the occasion of the Chicago premiere of Some Like It Hot. Bellow was bowled over by her." Yet Miller perceived things quite differently; he was embarrassed by her when with his friends. She discovered this in a diary entry of his; he was "disappointed" by her. She never overcame her sense of betrayal by Miller; she only felt more unworthy, a theme that ran as a poisoned thread through her life. Her love of books was genuine, and if it seems that she lost no opportunity to be photographed while reading it was only a desperate need to be taken seriously as a human being and as a thinking, intellectually curious, down-to-earth woman with something extra beyond her obvious physical charms that motivated her; she should be forgiven. The magic castle of Hollywood and her image had become a prison and she did what many of the incarcerated do to keep from going insane. She retreated into the private world of books and explored her thoughts and feelings as a diarist and journal-keeper. 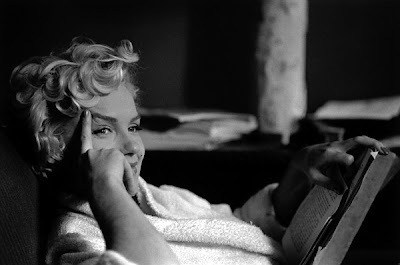 An emotionally fragile woman, it is in photographs like the above that Monroe's intelligence shines through her eyes. And as we readers know, the world is never better than when sitting down, comfortably in a robe, lost in a good book. Cares melt away. I suspect that she was never more content than when in the company of books. They don't betray. They won't wound you. Here are a few other books which weren't included, but Monroe was reported either to have read or owned them. 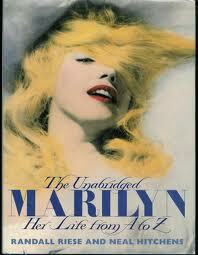 Most on the list are cited in the Unabridged Marilyn. The above list compiled by Everlasting Star. Arthur Miller On Marilyn Monroe's Sense Of Humor, Etc. Heartbreaking Marilyn Monroe Letter Estimated At $30,000-$50,000. The Most Significant Marilyn Monroe Autograph Document Comes To Auction. I linked to this article on the Biblio.com blog, Bibliology. Thanks for writing such a nifty article about Marilyn Monroe! How cool that Marilyn was a bookworm! I linked to this article on my bookblog! Wow! Totally impressed, and totally jealous - looks *and* brains??? I wonder if Christine O'Donnell has ever read book 297 on that list. Thank you so much for this very interesting blog about the "bookworm" Marilyn! It's always amazing what can be found under this "blond shock of hair". This is fantastic. 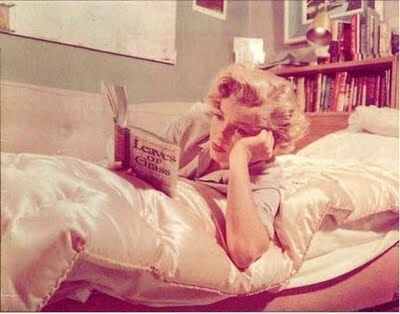 Ive just been compiling a group of photographs of Marilyn reading and came across this. The boomers really poisoned Marilyn's historical well with all of their sexism, narcisissm & endless, juvenile sexual hangups. She's one of the most iconic ladies of all time. But sadly taken for a dumb blonde. It's sad the way society tags all beautiful women as dumb. Did anyone catch '332) Baby & Child Care by Dr Benjamin Spock (pub. 1958)'? That one made me sad. She really wanted children and she suffered miscarriages. The more i learn about Norma the more she reminds me of self! I'm help i found this page new books and books I could not think of. But now i have some of them. see her in her older years. 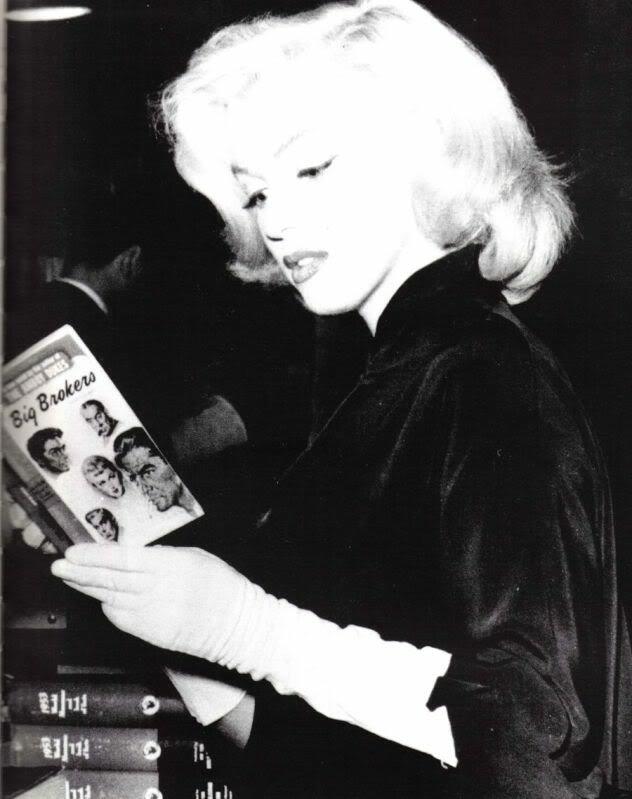 As a "Baha'i" I would like to know "Charlzetta", that had dedicated the "Baha'i Prayer Book" to unforgeteble "Marilyn". Never knew she was a bookworm! I have a new respect for her! On points 1 and 2 one may confidentally concur, as all the necessary evidence is in the public domain; re. point 3... not so much-- you are aware M Gertz's article refers to a woman whose now-globally-iconic stage persona "Marilyn Monroe" has become half a century later perhaps the single most widely-accepted and potent memetic allusion available when one wishes to refer to the very apotheosis of delectably-buxom-yet-not-Rubenesquely-zaftig femininity? There would seem to have been (judging critically from any and all available recorded images of her past a certain age, and notwithstanding certain known surgical edits and augmentations) every sort of foundation (to put it delicately!) for this sweeping view... Cheers! I found it fascinating that Marilyn Monroe had a copy of Mae West's autobiography, "Goodness Had Nothing to do With It" in her library collection. West who might have felt threatened by Monroe's stardom, would have been thrilled to know this.